Visiting the Philippines and seeing it for themselves is something that I’d like my family members to do. I still have been unable to get any of my immediate family members here, but one of my cousins that lives in Connecticut wants to come for a visit. He is a first cousin on my mom’s side of the family and I’ve only seen him once in about 30 years. He is married now and I have never met his wife, heck as of this post, I have not even seen a picture of her. I did get to hear her voice and she sounds nice. I advised him to buy a webcam so we could have a video chat and I could see her. He has already ordered it and it should be in soon. He says that they will be moving to Texas after his visit here. They are already looking at land to buy. His mother already lives in Texas. On March 4th we had about a 10-second power outage. Usually, I would not even mention that in this blog, but after this one, my internet would not come back on. I called Globe, but they could not do anything from the office because my computer wasn’t synced with them. They wanted to send a technician out, tomorrow. Without thinking, NO it wasn’t on purpose, I tried to recycle the modem while I was talking with them on the phone. Since my phone is connected to the modem, that cut them off. I was going to call them back right away but decided to write my notes for this post first. While I was writing, the internet came back up. Jumping all the way up to 15 March (I need to take notes better), this is our 2nd day with no water. I have no clue why, just nothing. (I have since found out the reason and will be sharing that in the next post or the one after). My niece Catherine just left for the local water pump down the street. She was carrying a basket of dirty laundry. The laundry builds up fast when you have 4 children. We are not so affected in our house because we save water for things like this. We have a few small buckets of water and 2 large trash plastic trash containers full. Plus we have many liters of drinking/cooking water around the house. I had spaghetti for breakfast this morning. It was just like when I was single (a billion years ago) almost. The difference is, this spaghetti I warmed up and it tasted better than the cold spaghetti I used to eat when I was single. I still don’t mind cold spaghetti though. Cold fried chicken is good also. The notebook showed up from Grace today. She must have purchased this one in Australia. 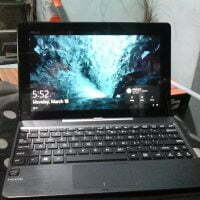 It is a T100 series ASUS tablet. It just looks like a miniature laptop and came with a cloth carrying case. It should work fine. Since I’ve never owned a laptop or anything like it before, I will have to figure out the ways to use it without driving myself crazy. I’ll just set it up the best I can and when it comes time to travel, I’ll have a computer with me instead of hoping I can find one during my travels. I’ll just need wifi now. If we do have a power outage at the house, I can use that with the wifi from the Ciriaco across the street. I think they would give me the password, they did before when I needed it, before I got my own wifi. I heard something strange last week, but I was so desperate and so cheap, I decided to give it a try. I’ll have to get into that in the next post though. I hope y’all will be there to read it. Looking forward to your cousins visit! I am too, sometimes. I worry he will be too much for the locals to handle.